SunTegra ™ Solar Roof Systems offer homeowners the latest in solar roof-top design and an attractive alternative to standard solar. 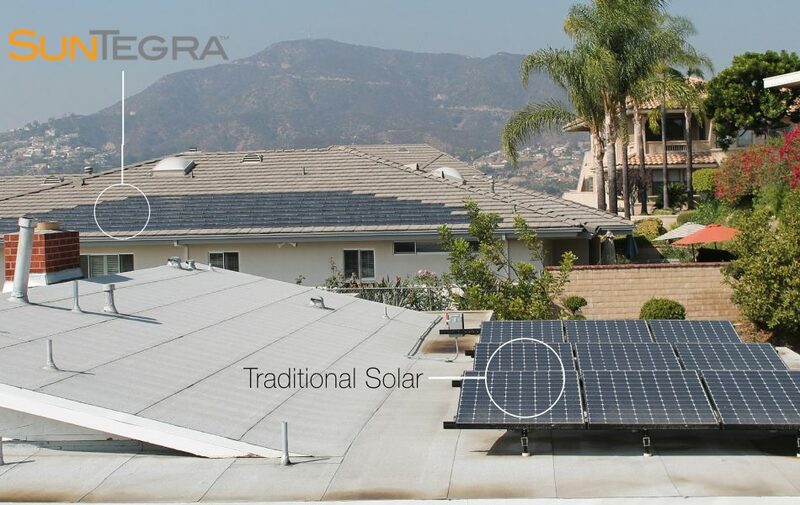 SunTegra Solar Tile and Shingle Roof Systems simply and seamlessly integrate into the roofline instead of being mounted on a rack system over the roof, providing homeowners a durable roof and a sleek, low-profile solar option, which – surveys show – is preferred by 3 out of 4 homeowners. Easy to install, industry proven, and attractive, SunTegra offers homeowners the traditional benefits of solar without the traditional “look” of solar! SunTegra are certified building products that produce solar power and serve as a protective roofing material. SunTegra uses proven, high-efficiency solar cells and an innovative ventilation system to ensure premium clean, green solar electricity production. 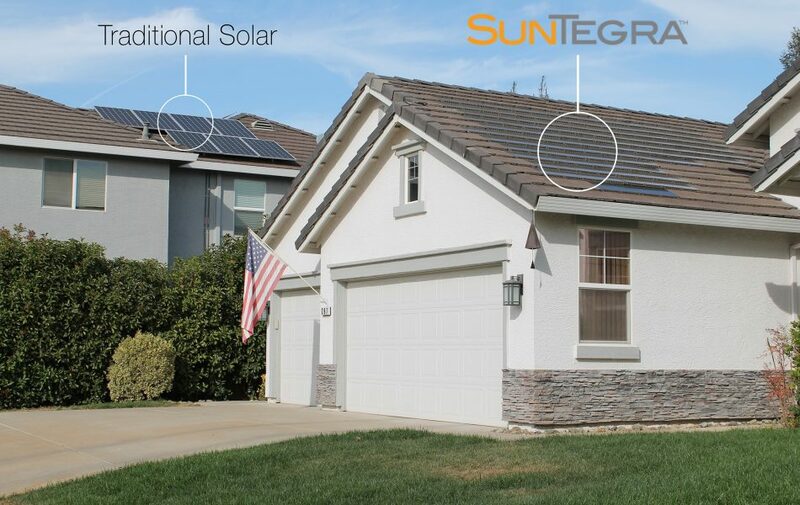 SunTegra’s unique in-roof design provides a sleek, low-profile appearance that allows homeowners to go solar for the positives without compromising on aesthetics. SunTegra offers all of the economic benefits of standard solar products – significant savings on your monthly electric bill, protection against higher electricity rates in the future, and system cost savings from federal, state, and local incentives. Research shows that in general home buyers are willing to pay a premium for homes with solar. With SunTegra, homeowners get the security of having a solar system that preserves curb appeal, helping maximize resale value. Integrated design provides added roof savings because a SunTegra system is the roof – no need to pay extra for roofing material under the solar system and no need to pay to remove and replace panels when time to reroof your home. Like any investment you make in your home, you need to fully evaluate the options. To help you better understand how a SunTegra system will work for you, the SunTegra team or a SunTegra Partner can provide a free, no-obligation estimate customized to your home’s location and solar potential.